Dark Entires Records is honored to re-issue the debut EP by FALL OF SAIGON. The band was born in 1981 when Florence Berthon (Vocals), Pascal Comelade (Organ, Synthesizer) and Thierry Den (Guitar, Vocals) met at a concert in Montpellier, France. They chose to the name the project FALL OF SAIGON after a song by UK post-punk act This Heat. They self-released their debut EP in 1983 citing Nico & The Velvet Underground, Suicide and James Joyce as influences. At the time the band formed, Pascal Comelade was an accomplished musician with instrumental sketches composed for the trio. The 6 songs on the EP were recorded in two stages. “She Leaves Me All Alone” and “On The Beach At Fontana” were sung by Thierry and recorded at Pascal’s home on a Revox 2-track in one shot. The four songs sung by Florence – “Visions”, “Blue Eyes”, “So Long” and “The Swimmer” – were recorded and mixed at the Montpellier Languedoc Video Animation Center by Jean Alain Sidi on two ReVox A77 reel to reels and a small mixer. On “Visions,” “Blue Eyes” and “So Long,” the group employed a drum machine that could only play four or five rhythms with a single slider to increase or decrease the tempo. The songs were minimal: verse, chorus, no bridge, no intro. Built on a simple spine, they create a feeling of space with just a voice and an organ or synthesizer melody. Full of class and inventiveness, FALL OF SAIGON are often compared to Young Marble Giants due to the fragile, ephemeral quality of the songs. All songs have been remastered for vinyl by George Horn at Fantasy Studios in Berkeley. The vinyl comes housed in a full color jacket using the original artwork from the EP and includes an insert with lyrics and photos. 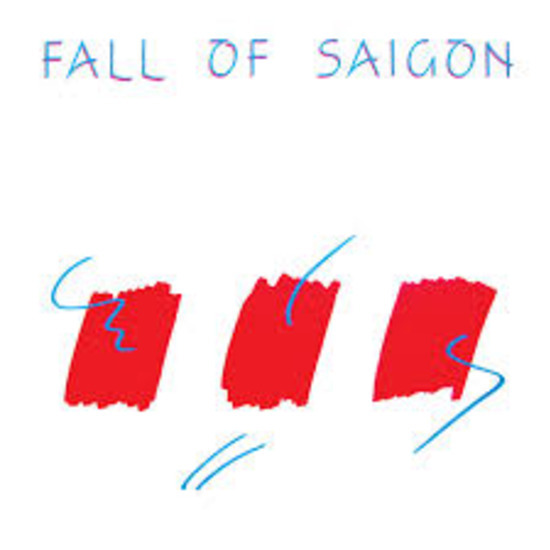 Through two years of existence, FALL OF SAIGON only released one EP and 30 years later their subtle sound is an essential guidepost in post-punk history.